The late afternoon mood at Thursday’s S&P Platts European Energy Summit, held in the grand ballroom of the upscale Renaissance Hotel in Düsseldorf, was dull. The gathering of international industry executives touched upon the transition away from fossil fuels. But by 5pm, no one had mentioned RWE AG’s struggle against demonstrators defiantly occupying the Hambach Forest. Less than 100 kilometers from the conference lies the Hambach lignite open-pit mine, the largest in western Europe. It is due to expand into the Hambach Forest, which has been occupied for six years by environmentalists. But while executives spoke about dropping demand for coal, thousands of police supported by tanks, helicopters, drones, and water cannons were forcing the removal of roughly 100 activists living in makeshift treehouses. To save the remaining 200 hectares of the Hambach woods, an international group of activists created a fairytale-like canopy community. Hosting workshops and curious visitors from around the world, they transformed the forest into an international symbol of resistance against fossil fuel extraction and burning. By midweek, following the peaceful confiscation of activist’s fire extinguishers after determining they could be used as weapons, the police deemed the treehouses a fire hazard and, in the interest of protecting the same forest slated to soon be torn down, ordered the occupiers out of the trees. To simplify the process, they drove tanks through the brush, clearing a bigger path, enabling them cut through the treehouses with chainsaws. But on Thursday evening, with the chaos far away from the dim conference light, Henry Edwardes-Evens, Editorial Director for Power at Platts, was moderating a panel entitled “The transition to clean energy in Europe.” Sitting next to Katja van Doren, RWE Generation’s Chief Financial Officer, he opened the session by asking her what the main challenges and policies were towards the reform of the coal sphere. After a banal discussion around capacity market mechanisms and auctions, this reporter finally asked van Doren to make an economic case for why the Hambach Forest has to be destroyed now, even if in doing so, RWE splits the coal commission apart and creates an international backlash against it in the process. 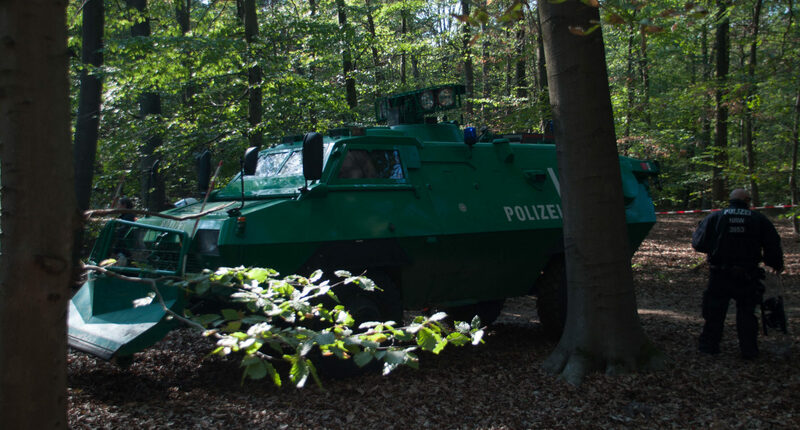 Shuffling her papers to find the proper prepared talking points, she responded by stating that the on-going police intervention was initiated by the local NRW government, not at RWE’s request. Nor was this the beginning of a forest clearing, “which will be done in mid-October and is necessary to maintain production at the Hambach open cast mine.” Indeed, “for us, this is a business model that cannot depend on symbolic politics. We have to take care for our employees at the power plant and the mine. The plan was agreed to long ago.” And that was that. No further comments allowed. Just back to market efficiencies. By the following morning, the New York Times, the Guardian, and scores of international and German news outlets were reporting on the struggle in the forest which they said “highlighted the disparity between Germany’s pledges to reduce its carbon emissions and uphold its commitments to the Paris climate accord” against its “heavy use” of lignite. Ironically, the police claim to be acting in the protesters’ best interests. As media poured into the forest, police stated that “in order to protect the lives and bodies of the protestors,” they had designated the forest a “dangerous area” where they were now maintaining a round-the-clock presence to facilitate tearing protestors out of the trees. Framing the situation as another example “that politics and economics are too close together,” Maryann Timon, Campaigner at Greenpeace and a former Heinrich Böll Stiftung scholar, gave a series of interviews to on-the-scene reporters. “Here we see that the police decided to implement what the corporation decided to create,” she said. Late on Friday night, as the growing media presence beamed the struggle around the world, the 4,000-strong police force closed the forest to reporters. But the following Sunday over 7,000 demonstrators flocked to the nearby town of Buir to show their support. 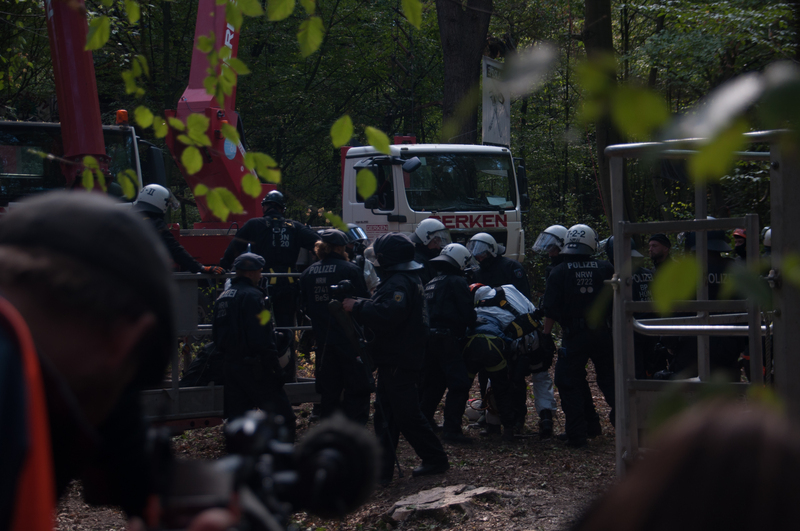 After the march, some demonstrators broke through police ranks to hide themselves deep in the Hambach, while others tried to get into the mine pit itself. Across Germany, solidarity actions including the occupation of other power plants took place as thousands marched in dozens of cities, including over 700 in Freiburg. 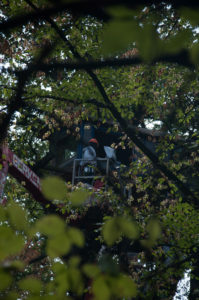 Undeterred, police vowed to clear the remaining treehouses by the end of the week even as more protestors arrived in the area in preparation for larger demonstrations to come. Both sides are digging in ahead of the mid-October date RWE has set for the forest’s final judgement. Next PostQuestionable methane estimates in the gas industry: the lesson from the U.S.